Almost fifty years old, around thirty of those actively working to inform and promote music of worth even I find it hard to believe there are still moments of real excitement which run deep through these old bones. A couple of years ago I’d recorded a band’s all-too-brief studio output (singles and compilation tracks) onto CD from crunchy vinyl for posterity/ease of access and shortly afterwards one of those rare jaw-drops hit. This band had only just gone and reformed. 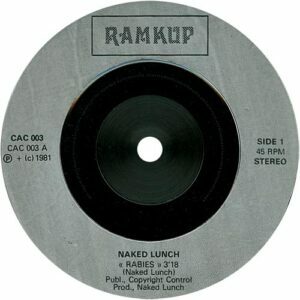 The band was and now IS again Naked Lunch. THE Naked Lunch, one of the forces of English Futurism which furthered my own youth development. 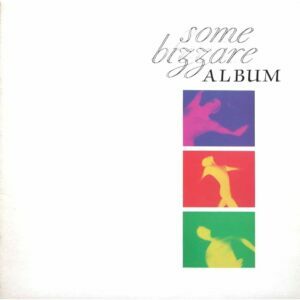 I still regard the ‘Some Bizzare’ album as the finest compilation album of all time and ‘La Femme’ by Naked Lunch its greatest track (well, along with Illustration, Soft Cell, Mode, The Loved One… Oh hell, I love them all, but ‘La Femme’ IS the best track on Side One! ), put that alongside the remarkable ‘Rabies’ single (banned by BBC Radio I believe – it was the Eighties) and I’ve always felt with those two songs at the core they could have produced one hell of a debut album. Who could have thought thirty years after their last single ‘You Tie Me Down’ was released ‘Beyond Planets’ would offer us oldies and a whole new breed of young electro-junkies a full taste of the revamped analogue (now via digital) moveable attack that always was Naked Lunch. So, rather than me just waffle about the album, after all this time it seemed appropriate to speak to their main-man, vocalist, computational interrogator and punkin’ instigator Tony Mayo on the past, the (still sounds strange saying this) debut album and possible futures now Naked Lunch are back and progressive. It would be another two years before this spotty insular 14 year old discovered them and the Some Bizzare Album but keys were rolling while musical (guitar) anarchy died; “Back in 1979 I left a punk band with the idea of doing electronic music with a punk music approach. I worked on a few songs with a guitarist and after I put an advert in the Melody Maker Mick Clarke linked up with us. Mick and I moved into a flat in Finchley and continued to work on songs. We were then joined by Cliff Chapman and not long after Paul Davies due to the other guitarist being unable to continue in the band because of injury. “We played a lot of gigs during 1980 and undertook our Electronic Indoctrination Tour, taking our brand of aggressive electronic music around England, with part of our Futurama II performance ending up on BBC2. We were at the forefront of the scene and were very much into playing live and tried to get people interested in electronic music. We recruited Mark Irving early in 1981 as our drummer. In 1981 we also did the 2002 review tour, had our song ‘La Femme’ on the Old Grey Whistle Test and were being hailed as the next big thing but sadly that was not to be”. Anyone who has, or had an interest in UK electronic music will be aware of the legendary Stevo, the man behind the Some Bizzare label. A larger than life figure who certainly had a different way of working the industry. Signing major label deals for the most alternative of acts such as Test Dept, releasing Psychic TV, Coil, Einsturzende Neubauten, gaining commercial success with Soft Cell and allegedly persuading Stephen Mallinder of Cabaret Voltaire to go naked with his vox. Acrimonious splits aside with most of the bands associated with him, he must be given credit for pushing these unlikely talents into a commercial spotlight. It is of course no surprise to learn now that Stevo wasn’t working alone in the early days; “We linked up with Stevo in early 1980 and I used to DJ with him at Gossips and the Chelsea Drug Store, driving him in my transit van. We worked with him to promote the electronic music scene and he came with us to DJ at various gigs on our tour. He had the idea of a compilation so we started talking to bands and asking them to go on the album. Matt Johnson from The The lived near me and we also knew a few other bands who then featured on the album. Fast Forward. From the heady mid-Eighties and even though there has been no recorded output or live sightings the heart of Tony’s passion had still been beating; “I always regretted that we had split up and had kept on working on material over the years. Then late in the Noughties Paul and I linked up via a MySpace he had set up for Naked Lunch. A message was sent to him that he would know could only come from me and we then met up. After several social meetings we agreed that we had been total idiots splitting up. We both felt that we wanted to relight the name of Naked Lunch in electronic music, as we were only a brief mention in Depeche Mode’s and Marc Almond’s Biographies. ‘Beyond Planets’ certainly has enough solar spectrum to appeal to those who treasure their original studio rarities and anyone unaware of NL pre-2012. Its darkness is balanced immaculately with a smooth, semi-commercial sheen. ‘We Are’ slowly countdowns. We’ve waited so long for a full album tenterhooks are finally released as pulses drive and rasping voice anthems… “We are ONE”. Blast off. A clever opening as tempo rises again with ‘Slipping Again, Again’, that voice riding the percussion and dodging guitar shards. Similarly ‘Glow’ pushes ahead with EBM-precision and snarling vox whilst ‘Weekend Behaviour’ leads a lighter edge, more in keeping with its original from the ‘Plezure Starts Here’ compilation. The calling synths reel from an earlier timeline. ‘Slipping Again’, another oldie is a perfect reworking, fast and rhythmic undertowed by a deliciously enhanced bass-line vocal. ‘Alone’ washes through hypnotically, quite possibly the standout cut of the album; an immensely seductive track. Easily enjoying playtime on day/night-time radio and dim-lit clubs alike. It is of course just my problem but the two tracks which am not so fond of are ‘Rabies’ and ‘La Femme’. How’s that for irony! The originals have been played, listened to, dissected to death and ENJOYED over more than thirty years (you too can get them from the band’s limited ‘Frozen’ reissue EP) but their sheer full-knuckled punch has been a little blunted on the new versions here I feel. I’m picking hairs I know because for many these tracks will be their first viewings and won’t be numbed at all by my pre-conceptions so ignore me, I’m a grumpy old man most of the time! ‘Fade Away’ closes the album in Neu! Futurist Sci-Fi style. A myriad of voices vapour-trailing until warp-speed decreases and landing docked. In all, a pretty amazing debut bristling with optimistic energy. I hope it finally gains the band the level of attention they fully deserve for past and future. Here’s to many more decades. Over to Tony, where next? You can also follow me via Twitter @deadhead_TEQ and @bazzanagnagnag the latter where I babble endlessly on music, horse racing, politics, life and society (lack of); expect bad language.